On the 5th of October 1881, there was very little happening to attract the attention of the London theatregoer. Covent Garden, Saddlers Wells and the Lyceum were occupied with Grand Opera, most of the drama houses seemed to be doing revivals, and both St. James's and the Haymarket were closed for renovation. Wilson Barrett was scoring a personal success at the Princess's in the 'Lights 0' London', and in Dublin, Henry Irving was electrifying the Irish with the Lyceum classical repertoire. Down by Victoria Embankment, however, plans were afoot to electrify the theatre scene in a very different way. For Richard D'Oyly Carte, it was the culmination of a dream. Here was a man whose wit, sagacity, gentleness, irrepressible good humour, keen insights and self-deprecatory manner caused most people to detest him immeasurably and respect him immensely. He was widely experienced in the ways of the world, and a more than shrewd businessman. In his capacity of Managing Director to the Comedy Opera Company he had contrived somehow to hold the company together for nearly five years, and make money at the same time, in spite of boardroom dissension leading to the formation of rival companies, fist fights on stage over disputed ownership of scenery, and pirated versions of his productions being presented simultaneously next door at the Olympic. Putting on a production in those days was a cut-throat business. Theatre leases were brought and sold, but merit and art had very little to do with it. Then, as to this day, one overriding factor mattered to the owners of a theatre, and that was the financial reward. When the lease of the Opera Comique was nearing its end, Carte decided that enough was enough, and that rather than seek renewal, rather even than try to find another venue and therefore be beholden to the vagaries and corruptibility of the owners of the bricks and mortar, he would seek total independence. The result took only a matter of months to rise from a piece of waste ground by the riverside. It was the Savoy Theatre. This was to be in every respect the best theatre that he could make it. Never again, he vowed, would he attempt to cram 'twenty love-sick maidens' onto a stage ideally suited to ten. The orchestra pit was to be large enough for the extra musicians for which Sullivan was always agitating, and, spurred by Gilbert, who had very firm ideas on production standards, coupled with a healthy contempt for the commonplace, he intended to make the technical facilities second to none. It was to have the best of taste in decoration, the finest of ventilation systems, and it was to be the first theatre in the world to be lighted throughout with the incandescent filament lamp. The phenomenon of light produced by electricity had been known since about 1800, when Sir Humphrey Davey, (he of safety lamp fame), discovered that his latest toy, a voltaic battery of great power, could be used to heat strips of platinum to incandescence. He also showed that a brilliantly blinding light could be produced between the tips of two carbon rods if they were briefly touched together, and that this light could be maintained for as long as they, and the power lasted. This led to the development of a great many devices for floodlighting and public street lighting, but it was not until forty-five years later that we first hear of its use in a theatrical setting. At the Princess's, Charles Kean, (no sluggard, he, at trying anything new) used it in an otherwise unremarkable pantomime entitled 'Harlequin and the Enchanted Arrow' as a wide-angle floodlight. It was adjudged less than successful, according to the critic of the Times, who dismissed it as 'sickly' and accused it of 'producing giant shadows'. 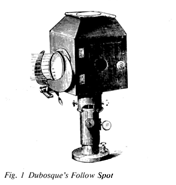 Later, in Paris, M. Dubosque invented the first of what turned out to be a whole circus of special effects, including sunrises, stars, rainbows, lightning flashes and most important of all, an arc, with a reflector, in a housing with a lens and some shutters (fig 1) which could be used as a follow spot. In London, Kean used it, or one copied from it, to great effect, for many years. In 1879 a new theatre had opened in Lyons, which had taken the novel step of lighting its auditorium by means of electricity. 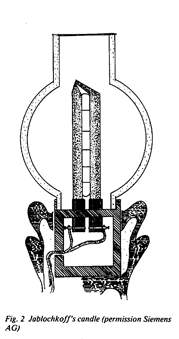 This did not employ filament bulbs, but used a system of arc light known as the Jablochkoff Candle. These consisted of pairs of carbon rods separated by a quarter of an inch or so by a strip of meltable ceramic insulating material. (fig 2). The rods were connected at the top by a very fine strip of carbon, sufficient to strike arc. As the rods were consumed, the material would vapourise and reveal a fresh supply of carbon. The whole assembly was contained inside a glass bell. There were two main drawbacks to the idea. The first was that it required an alterating current to allow the rods to be consumed equally, and the second was that hey went out, even momentarily, they could not be restruck. As the common practice at the time was for arcs to be wired in series, this meant that it was very much a case of 'One out-all out!' The management also fitted gas to cover contingencies such as these. The light of the carbon arc, however white and bright it might be, was more or I useless for domestic use, and its flickering harshness and lack of controllability, did not endear itself to the people of the theatre for general stage lighting purposes, although it was later to be developed into the very fine follow spots and projectors, such as the Stelmar, the sunspot, and Super Trouper. Besides, gas lighting was considered a perfectly adequate, albeit dangerous medium, and still relatively new limelight was thought be the best and most useful means of placing a spot of light in a particular place the stage. Davey's experiments with incandescent platinum had impressed a number of people who carried on experimenting in this direction. In 1820 De Rue had enclosed platinum strips in a piece of evacuated glass tubing, and in 1840 , Sir William Grove lit a whole auditorium with feeble incandescent lamps These consisted of platinum coils covered h inverted tumblers in glass dishes partially filled with water. The first patent incandescent lamps was in 1841. These were glass globes filled with powdered charcoal. Envelope blackening at an alarming rate rendered them impractical, but experiments continued, and the principle was well and truly established that filament lamps would work if only the problems could be solved. There were some who believed that they could not: As late as 1878 a group of eminent scientists appointed by the British Parliament issued a statement in which they boldly asserted that: "The sub-division of the electric light [into a number of smaller units suitable for illuminating homes and workplaces] is a problem that is not capable of a solution by the human brain". Their American colleagues endorsed this view. On each side of the Atlantic a number of men had taken this attitude as a personal challenge. Among them, Thomas Alva Edison in New Jersey and Joseph Wilson Swan in Newcastle on Tyne quite independently set about passing currents through filaments made from a variety of materials. They quickly found that the feeble and ephemeral light produced from the filaments could be brightened and prolonged by enclosing them in a glass bubble from which all the air had been removed. Even so, as the voltage applied to them was increased to more than a nominal amount, the filaments failed. This caused the experimenters to turn quickly away from expensive and precious metals like platinum and iridium, and concentrate their experiments on carbon. This substance of course comes in a tremendous variety of forms, ranging from diamond to soot. The problem was to find a form which could be fashioned into a filament that had sufficient mechanical strength, as well as exhibiting the appropriate electrical characteristics. A variety of substances were carbonised in special kilns including cotton thread, baling-twine, angling line, coconut fibre, violin strings and crocodile leather, as well as the other 7560 other substances listed in Edison’s papers. His prayers were answered when he tried a piece of bamboo, plucked it is said, from a ladies’ fan. In England, J. W. Swan was having some success with cotton thread prepared from coal tar and shaped like a hairpin. The brightness that he was able to obtain was comparable to that produced by a standard gas burner, but unfortunately the life of the lamp could be measured only in minutes. Rightly suspecting that the vacuum in the bulb was not all it should be, he obtained a powerful Sprengel Pump. The use of this improved lamp life to an hour or more. He then hit upon the idea of evacuating the bulb while the filament was hot. This prevented gasses trapped on the surface of the filament boiling off when operated and spoiling the vacuum. This succeeded, and Swan began logging times of forty, one hundred, and eventually six hundred hours. Edison is said to have read of this in a research paper in August 1879 and immediately improved his own lamps to the point where they became commercially feasible. He also designed, of necessity, all the accessories, the bulb holders, switches, plugs and sockets, consumption meters and generating plant. Sabotage by the Gas Co.
Edison's genius (“99% perspiration, I% inspiration”) extended to public relations and marketing, and his public demonstrations were noted for both originality and splendour. It is said that at one such demonstration, a short-circuit deliberately introduced by one who could only have been an employee of the Gas Company, succeeded only in blowing one of Edison's new and patented fuses, losing only one or two lamps. The whole thing rebounded to Edison's credit. The culprit was ejected, the Gas Company's shares plummeted and the Shares of the Edison Electric Light Company rose from 106 to 3000. By 1880 Swan had lit his workshop and indeed the whole of the street with electricity, and this attracted a great deal of attention from people in all walks of life, including the theatre. Thus both men succeeded in their principal aim: to produce an electric lamp that was within the reach of all. Not a lamp for the millionaire, but for the ordinary man. Initially, the two companies were so successful that the price of a light bulb dropped from one pound to less than five shillings. Later there were to be many bitter arguments, patent suits and recriminations as to who was the true inventor. The truth of the matter was that both men simultaneously responded to the needs of the time, taking what was obviously the next logical step. As it happened they were soon to realise that cooperation was better than competition, and eventually amalgamate into the Edison and Swan United Electric Company. It was to the Swan Company that Richard D'Oyly Carte turned when the concept of electrifying the Savoy was mooted. Having seen 'electric light in lamps' exhibited outside the Paris Opera House some years previously, (carbon arcs in floodlamps) he had been convinced that 'electric light in some form is the light of the future in theatres . . . the peculiar steely-blue colour and flicker which are inevitable in all systems of arc light make them unsuitable for use in any but very large buildings'. He was not, it seems, a particular admirer of gas as a medium, and had strong views on the mutual incompatibility of clear singing voices and fumes from gas burners. “the greatest drawback to the enjoyment of theatrical performances are undoubtedly the foul air and heat. As everyone knows, each gas burner consumes as much oxygen as many people. Incandescent lamps consume no oxygen and cause no perceptible heat". He did, however appreciate the safety factors which were inherent in the use of properly rated and appropriately insulated cables and lighting fittings coupled with safe installation. In the same year that the Savoy was fitted out there was a catastrophic fire at the Viennese Ringtheater, with the loss of 450 lives. The fire broke out as the gas burners in the borderlight battens were being lit, and spread with alarming rapidity owing to the highly inflammable nature of the scenery.Although a safety curtain was fitted at his theatre, it was found to be impossible to lower it due to it's buckling with the tremendous heat. The ambient temperature /as usually so high in gas-fitted theatres-measured by Captain Shaw of he London Fire Brigade at up to 105' in he grid of the Alhambra-that any residual moisture in canvas and timber must long since have evaporated, and be very prone to instant combustion, once ignited. This when firefighting equipment largely consisted of long poles with billhooks attached for cutting down burning scenery, hand pumps and buckets, and a few wet blankets. "The fate of a theatre" note the editor of 'The Builder* in 1856. 'is to be burned. It seems simply a question if time". In the twenty-five years prior to 1881, theatres were destroyed by fire at the staggering average rate of one per month. Electricity had it's own problems, but fire hazard on this scale was not one of them. It is, however, interesting to note that it was he standard practice of the insurance companies of the time to demand a higher premium from theatres equipped with electricity than from one fitted for gas. At the Savoy, the electric power was produced in a shed erected on a piece of waste land outside the theatre. A motley collection of steam engines were arranged to drive six large alternators of German Manufacture. The field coil excitation voltage for these was simultaneously generated by six small dynamos (fig 3). The theatre itself was wired in six mai n circuits, corresponding to the number of generators, various areas being protected by sub-fuses. each area was initially provided with a switch. Main switches for each group were also provided, and it is reported that when they were operated, the flash that resulted could be seen in the auditorium if the scene was dark. The stage lighting fittings themselves were not especially novel or noteworthy, being made as electrical versions of existing designs of footlights, wing towers and battens. Altogether there were 824 lamps )n the stage, giving in total a light output equivalent to about 3000 modern watts. Of hose, 718 were above the actors' heads, 50 were floats and portable units, and the remainder were fixed to the side wings in the traditional manner. The houselighting consisted of 114 lamps, mainly in three-branched, brackets around the auditorium circle fronts. (fig 4) It seems not to have been envisaged that the houselights should be dimmed during the opera, possibly due to the fact that reading the libretto was 'quite the thing' during the performance, and indeed the sale of these must have been a profitable sideline. One of the few things that Carte had greatly admired about gas lighting was the ease with which its intensity could be adjusted from a central gas plate. 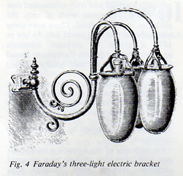 One of the more impressive features of the incandescent lamps was the fact that, as the applied power was decreased, the output light also decreased, more or less in proportion. 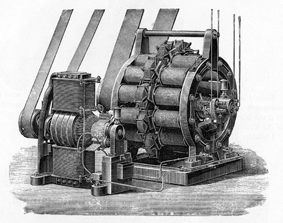 Siemens Bros. and Co., who had done the installation, manufactured a series of open spirals of iron wire in a frame, and connected them between the generators and each group of stage lamps switched in and out of the circuit as required, they acted as the first ever resistance dimmers. On October the 4th, D'Oyly Carte had confidently allowed the running advertisement in 'The Times' to be printed as usual. “The Grand Opening of the Savoy to the public will take place on the sixth of October . . . by which date it will be lighted entirely by electricity”. “SPECIAL NOTICE. The opening night is unavoidably POSTPONED. until Monday 10th October to complete the very complicated works and experiments connected with the application of electric light to the stage. Mr. Carte trusts that the novelty of the undertaking will be an excuse for this delay. Like many a more modern occasion when bold steps are taken with untried technology, there were complications. The fact of the matter was that the alternators would not supply sufficient power to light the whole system. It is hard to believe that Messrs. Siemens' calculations were at fault: by 1881 they had supplied a large number of generating sets worldwide, and their experience was undoubted. Even so, this was still uncharted territory for the Victorian engineer-electricians. They had yet to learn of some of the more unexpected effects of alternating currents. It is hard to see over a span of a hundred years exactly where the problem lay, and at the same time easy to see with the benefit of hindsight where the areas of difficulty could have been. As Carte pointed out, never before had it been attempted to light so many incandescent burners at a single time. He wrote to papers explaining that he would 'procure an additional steam-engine immediately' in the hope that it would solve the problem. It did not. However the houselighting, for which no dimming facilities had been provided, worked very well. It was then decided not to postpone the opening further, but to go ahead under the conditions in which they found themselves. It was perhaps a source of particular annoyance to D'Oyly Carte that the full lighting could not be employed on the opening night. Apart from any embarrassment involved, there were other factors, among which was the fact that the Paris Opera was being temporarily fitted out for the opening in five days time of the Grand Electrical Exhibition and Congress. Seven different and rival electrical systems were being erected side by side, including the Swan/Siemens, Edison and Maxim schemes, for the benefit and comparisons of the trade. There were obviously great commercial interests at stake here, so it comes as no surprise to learn that most of Siemens' specialist electricians had decamped to Paris to lend a hand and their experience from the Savoy to what must have been the biggest fit-up ever up until then, leaving the Savoy Theatre more or less high and dry. Fortunately the management were in a position to revert temporarily to an older, well-tried backup system, having had the foresight to have had the theatre fully fitted for gas. The work was carried out by the best-known name in the theatre gas fitting trade, Messrs. Strode, a magnificent example of whose artistry hung above the heads of the audience when they entered the theatre on the 10th of October-a resplendently glowing sunburner. They also saw, not the usual painted act drop to which they were accustomed, but a sumptuous drop-curtain in rich creamy satin set off with silk fringes. It was ornamented with two plaques of white figured silk upon which were applied comedy and tragedy masks, the cothurnus, buskin and other ancient symbols of the dramatic art. Above this 'symphony of the draper's art* they saw a matching valiance, surmounted by an elegantly dished top to the proscenium arch which they were later to discover was designed to be a sounding board to direct the voices to the back of the theatre. The seats were upholstered in inky blue plush, and the walls were lined in two shades of red velvet. Even before they had entered the building they had had a series of pleasant surprises. The elegant covered carriage entrance, large enough for five conveyances at once, led onto a well-appointed foyer. Those who had taken the opportunity to reserve their numbered ticket found printed on the portion 'to be retained' a simple plan of the theatre showing the way to their particular seat, while those who were accustomed to scramble for pit and gallery places found themselves marshalled into an orderly queue. All received, free of charge, a handsomely printed four page programme. “there was a hum of expectation and anxiety throughout the house. The effect was instantaneous. A start, a pause, a tremor, and suddenly the auditorium was literally brilliant with the novel light” wrote the 'Telegraph'. The light is far too strong, the lamps too numerous, the glare too powerful, and I found my eyeballs aching, and my head throbbing, and I soon discovered that it was as imprudent to stare at an electric lamp as at the sun. I should say that the Savoy should be as well lighted with half the quantity of lamps. The system behaved itself admirably throughout the performance of 'Palience' that evening, despite the odd flicker and slight change of intensity as the steam engines varied their speed from time to time. (A problem which had to await a solution until the perfecting of the storage battery). At the end of the performance, the public expressed an (almost) unanimous verdict of success not only of the lighting, but also of the production, it's new scenery, the theatre itself and all its arrangements (a bar with whisky that was whisky and coffee that was something more than just acrid chicory!). Even the ticket takers and other attendants received their share of approbation, not only for the smartness of their appearance and solicitude for the public, but also for the fact that they expected no tip, indeed they were expressly forbidden to accept gratuities on pain of instant dismissal. It was to be another eleven weeks of hard work before it was considered ready to announce the lighting of the stage by electricity. During that time performances continued under gas. The eventual solution of the problem was quite elegant in it's simplicity. The iron resistors were removed and replaced by a much smaller six-way 'regulator' (fig 5). 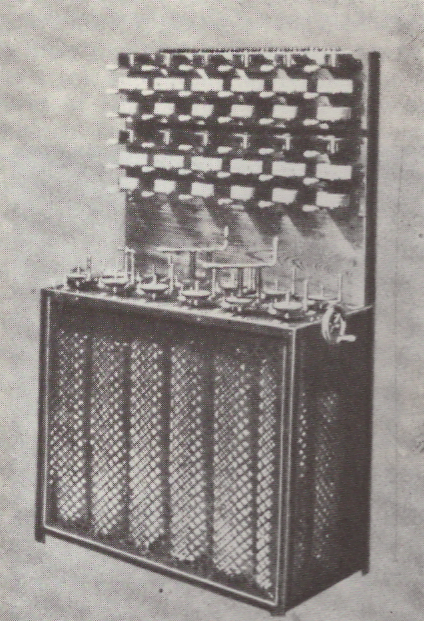 This consisted of half a dozen six-position switches connected to tappings on coils of German silver wire. These were mounted in a wooden frame positioned on the fly floor and were electrically connected, not to the output of the alternators, but between the dynamos and the field coils of the alternators. The operation of these resistances reduced the magnetic flux in the alternator and therefore the output voltage. It had the added bonus that it also reduced the magnetic 'drag' in the system, thereby effecting a saving in prime-mover power. in the artistic and scenic point of view nothing could be more successful than the present lighting of the Savoy Theatre: The illumination is brilliant without being dazzling, and while being slightly whiter than gas, the accusation of 'ghastliness' so often urged against the light of the electric arc can in no way be applied. In addition to this the light is absolutely steady, and thanks to the enterprise of Mr. D’Oyly Carte. It is now possible for the first time in the history of the modern theatre to sit for a whole evening and enjoy a dramatic performance in a cool and pure atmosphere. Worthy of special mention was the three-colour lighting already employed [in a gas theatre]. In each of the trough shaped units, the adjacent sockets were connected in three groups for the coloured lighting. In this way it was possible to bring in a red, a white and a blue of green coloured incandescent lamp alternatively into circuit. , A more common method , shown in fig.6, was to draw coloured medium of dyed gelatin or fabric round the body of the trough, which could be remotely controlled by tracker wires. [t can be read in reports of 1882 that the light emitted by the incandescent lamp even at maximum voltage had a warmer tone than gaslight , and that a very fiery orange could be obtained at medium voltage, and a definite red a low voltages. This richness in colour nuance of which this light is capable can be achieved at every instant however, since the light can be regulated with the speed of lightning, This statement is a fine example of how then - as now- enthusiasm for a new technology rated even the design faults and restrictions as positive virtues! However enthusiastic the public, press and technical people were, not everyone shared the euphoria, Ellen Terry, writing in her 'Memoirs' recalls We never had electricity installed at the Lyceum until Daly look the theatre, When I saw the effects on the faces of the electric footlights, I entreated Henry [Irving] to have gas restored and he did, We used gas footlights and gas limes there until we left the theatre for good in 1902, To this, I attribute much of the beauty of our lighting I say 'our' because this was a branch of Henry’s work in which I was always his chief helper. Until electricity had been greatly developed, it could never be to the stage what gas was, The thick softness of gaslight with the lovely specks and motes in it, so like natural light, gave illusion to many a scene which is now revealed in all its trashy glory. Perhaps (he key to Ellen Terry's pathological hatred of electric lighting - she even persuaded Irving to take three boxcars full of limelight equipment with him on his American tours as late as 1899 - was the idea of ' light that dances. light that lives'. still a laudable and much sought after goal amongst modern lighting designers , Experienced people of the 'theatre of illusion' like Irving and Terry knew from instinct precisely what would 'read ' on the stage and exactly what they could get away with, and just how tawdry they could be, and yet how magnificent they would seem! The 'specks and motes', the 'thick softness' of it, was in fact due to the heat haze rising from the floats , and the large amount of water vapour suspended in the air. In thisequivalent to a modern hazer, the joints in the flattage and the ancient stains on the floor must totally have disappeared: and in this even the dry makeup of the reputedly beautiful Ellen Terry, (composed we now learn of a 'maquillage' of Fullers Earth, rice flour. white lead, red lead, powdered antimony. rouge and burnt cork) must have looked good enough for her complexion to be described by contemporary writers as "radiantly natural, needing only a quick stroke from a rabbit 's foot to restore a healthful glow". One can imagine her horror when she beheld ' the effect of the faces in the electric foot lights". She used dry makeup to the end. Ellen Terry’s horror of seeing her face under harsh electric light was shared by the entire acting profession. A German actor named Ludwig Leichner experimented with a mixture of vermillion, yellow ochre, zinc white, and lard. This was capable of much more subtle effects. Later, the heavy grease - which gave the new makeup its name – was replaced with a much lighter oil. Scene painting and props too, underwent a sea-change. Like the coming of high-definition TV, every detail, every crease in a backcloth, every speck of dust on the scenery and every painted-on doorknob was revealed as a fraud and every golden crown betrayed itself as gaudy tinsel. Although the vast painted cloths could look absolutely beautiful, much of the painting technique was very basic. New techniques rapidly emerged which went a long way towards realism. This coincided with a whole new movement in written drama from, among others, Checkov, Strinberg, Shaw. Arguably, this new realism could have languished in the doldrums for a long tome in the context of a theatre dominated by the old school. However in this new mood for change, there was nothing to hold it back. It is at least conceivable that the coming of electric light kick-started the entire realism movement.